Beautiful in all 4 Seasons this Log home with walk out lower level on a paved road is close to the lake activity and now available today for you. 3 baths 3 + bedrooms, two kitchens and storage galore. Solid country oak flooring, solid hickory cabinetry. R30 insulated ceiling makes this a very energy efficient home. Basically it is heated with the Lp fireplace. New central Lp furnace and a/c in 2017. Large kitchen with corner window sink. Every square inch is used efficiently with open floor plan. Move-in ready! pack your bags and let's go ! 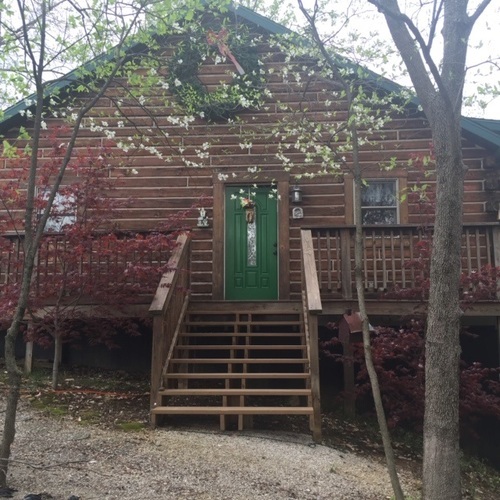 Your very own hide a way Cabin at Patoka Lake. Have you ever had this Dream? Shade trees with enough sunshine for a garden? Here It Is! end that dream and treat yourself for 2019. Close to Boat ramps, beach and marina, winery and restaurants. French Lick and West Baden resorts only 20 miles. A few Minute drive to the Marina. 30 minute Hike to the shoreline. This Cottage home can be yours. Watch the sun rise through the trees with your favorite coffee every morning on the covered or open deck. Then off to the Marina, walk on board your boat for the afternoon, a short drive back home, have lunch on the tree top deck. For outdoor grilling there is an open deck. Relax every evening with bottle of wine from the local winery and watch the sunset. All this and more 20 miles from Jasper or French lick West Baden resorts with casino and all the activities you can imagine for a rural vacation destination. Oh and not far from I 64 and 1.5 hours to Louisville Ky. 5-10 minute drive to the marina and restaurants. Have a Boat?....Rent a boat slip for the season at the marina and walk on board all summer long. Celestine is only 8 miles to the west. Directions:Hwy 164 in Wickliffe In at the main entrance of the DNR Patoka Lake Recreation: Turn north onto Dillard Rd. left on to Diwitte School Rd. drive around 3 - 90 degree curves to the property north of line of mailboxes.